LAST Friday, I took a 10-minute walk from an old hotel to ano­­ther old building, a confe­rence hall. About 300 others were on the same walk on the warm and sunny day. It didn’t seem anything remarkable or newsworthy. But this was no ordinary walk. Sixty years ago, on this same date, a small but powerful group of men and women took the same walk and then launched a movement that snowballed into a united anti-colonial and post-colonial battle. We had come to commemorate and celebrate the anniversary of the Bandung conference of Asian and African leaders, all of whom had just won Independence or were on the verge of doing so. The same grand Savoy Homann hotel was where the leaders had stayed, and they had taken the historic short walk on the Asia Africa Road to the Merdeka Building. Did Beijing 1995 Make Any Real Difference For Women? Twenty years ago, the Beijing Summit of the UN was seen as a pathbreaking attempt to bring about major improvements in the conditions of women across the world. But did it really make much difference? What has actually changed in terms of gender disparities? And what can we do to make sure that this time around—as the international community contemplates new global goals for sustainable development—there will be genuine and transformative progress for women? Quantitative Easing and The Great Recession: Who Wins? Who Loses? The Federal Reserve (“the Fed”), the central bank of the United States, is at the center of a big political fight, once again. Ron Paul, former libertarian congressman, says we should “End the Fed” and reinstitute a gold standard; Rick Perry, former governor of Texas, said the Fed policy of low interest rates is “treasonous” and Fed officials should be sent to Texas where they know how to “deal with” such people; Senator Rand Paul (Ron’s son) has put forward a bill to “Audit the Fed” and establish more Congressional control over monetary policy; and progressives from Senators Bernie Sanders and Elizabeth Warren to the Occupy Movement are highly critical of the revolving door between Fed officials and Wall Street, but oppose Paul, Paul and Perry’s “hard money” policies that would make life harder for debtors. This fight over monetary policy happens now and again in U.S. history. In the Great Depression of the 1880’s the populist movement of indebted farmers rose up to demand a looser monetary standard that would make it easier for them to pay their debts; the financial panic of 1907 ushered in a 7 year struggle that culminated in the establishment of the Fed; and the great inflation of the 1970’s and the draconian increases in interest rates that Fed Chairman Paul Volcker engineered in the late 1970’s instigated widespread protests against the Fed. Such enduring conflicts have real causes; in its founding and very structure, the Fed is a creature of the financial industry, yet the Fed has enormous economic power that affects everyone in the U.S. economy (and indeed, the world). Most importantly, it has enormous public power – to print legal tender (the U.S. dollar) – yet it has a political structure that to varying degrees insulates it from democratic control. And with the demise of fiscal policy as a strong tool of macroeconomic policy (conservatives have blocked the use of government spending and taxation as tools of economic policy), the Fed’s power to set interest rates has become the most important and flexible tool of macroeconomic policy. This is part II of a two-part series, excerpted from an article originally published in the March/April issue of Dollars & Sense. The full article is available here. Systems theorists, who study how organizations and systems change, offer some insight into farmers’ minimal recognition of climate change, and their lack of advocacy for climate-mitigation policy. Management scholar Connie Gersick describes systems—such as the farming sector—as being in equilibrium until fundamental factors change. One key factor can be “environmental changes that threaten the system’s ability to obtain resources.” As the system’s actors are faced with persistent, systemic problems, they experience mounting discomfort. Once key actors recognize that the system has become dysfunctional, they begin to search for new information about the sources of the problems and possible new steps. Newcomers enter the system and are enlisted or inspired to search for solutions. The entrenched understandings, relationships, and power dynamics of the system, finally, can be dismantled. Revolutionary change can happen and a new system can be created. The IMF and World Bank spring meetings, which used to be a major forum for global economic decision making, end today with few concrete outcomes, the Bank under fire for its human rights and environmental record, and the IMF still unable to make any progress on reforming its creaking governance structure. Finance ministers and central bankers from all over the world met in Washington DC this week for the IMF and World Bank spring meetings. The concerns caused by slowing growth in emerging market economies, collapsing commodity prices, and uncertainties over the future of monetary policies in the developed world were very real. Action to deal with them was not. Instead, all the IMFC – the ministerial committee that oversees the IMF – could promise was “vigilance” when dealing with “large shifts in exchange rates and asset prices, protracted below-target inflation in some economies, financial stability concerns, high public debt, and geopolitical tensions”. The centrepiece of discussions for this year’s meetings was supposed to be the critical upcoming United Nations summit on Financing for Development (FfD), slated for July in Addis Ababa. However, the background document prepared by the World Bank and five regional development banks did not tackle the breadth of structural issues that are on the FfD agenda. It reads more like a prospectus for increasing use of the banks that authored it. How Do Farmers See It? This is part I of a two-part series, excerpted from an article originally published in the March/April issue of Dollars & Sense. The full article is available here. Maine’s farmers are facing unprecedented challenges stemming from climate change, centered on the two key ingredients in agriculture—water and soil. Too much water can wash soil away, while too little limits crop production and dries the soil out. According to the University of Maine report Maine’s Climate Future, the “high-intensity rainfall events” that are expected to accompany climate change are “less effective at replenishing soil water supplies and more likely to erode soil.” Meanwhile, higher average temperatures mean that, for a given level of precipitation, less water will actually be available to crops, due to higher rates of moisture loss from the ground and from the plants themselves. As part of the 2011 “Assessing Maine’s Agriculture Future” study, we interviewed around 200 Maine farmers about changes in the climate and their expectations for the future of farming. We asked representatives and opinion leaders from a wide sampling of the state’s farming sectors about their reasons for farming, their concerns, and their hopes for the future, as well as changes in weather patterns and their related adaptations. In the last month, the international media has been carrying articles on the fight between the United States and China over the formation of the Asian Infrastructure Investment Bank (AIIB). Influential Western economic commentators have supported China in its move to establish the new bank and judged that President Barack Obama made a big mistake in pressurising US allies to shun the bank. The United States is seen to be scoring an “own goal” since its close allies the United Kingdom, Australia and South Korea decided to be founding members, as well as other European countries, including Germany and France, and most of Asia. The United States also rebuked the United Kingdom for policies “appeasing China,” but the latter did not budge. The United States did not give any credible reason why countries should not join the AIIB. Treasury Secretary Jack Lew said the new bank would not live up to the “highest global standards” for governance or lending. But that sounded like the pot calling the kettle black, since it is the lack of fair governance in the International Monetary Fund (IMF) and World Bank that prompted China to initiate the formation of the AIIB, and the BRICS countries (Brazil, Russia, India, China and South Africa) to similarly establish the New Development Bank. So Ben Bernanke is blogging now. He has basically defended his old idea that interest rates are low as a result of a global savings glut. Yes, it is basically the loanable funds theory of interest—with no consideration of the limitations associated with the capital debates—and the notion that the supply of funds, mostly associated to surplus countries like China, Japan, Germany and oil exporters, has pushed interest rates down. 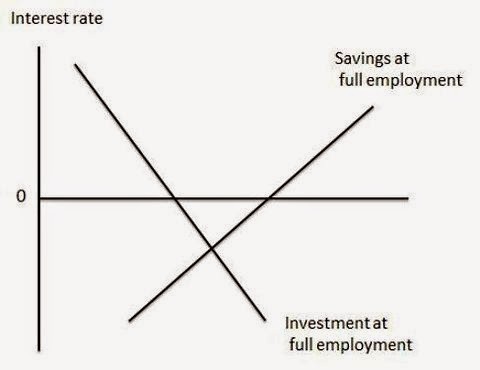 In Bernanke’s view the solution for the savings glut is: “to try to reverse the various policies that generate the savings glut—for example, working to free up international capital flows and to reduce interventions in foreign exchange markets for the purpose of gaining trade advantage.” This would, presumably, move the investment schedule and lead to a recovery. […] unless the whole world is in the grip of secular stagnation, at some point attractive investment opportunities abroad will reappear. If that’s so, then any tendency to secular stagnation in the US alone should be mitigated or eliminated by foreign investment and trade. Profitable foreign investments generate capital income (and thus spending) at home; and the associated capital outflows should weaken the dollar, promoting exports. At least in principle, foreign investment and strong export performance can compensate for weak demand at home. Successful policy approaches to a global tendency towards excess saving and stagnation will involve not only stimulating public and private investment but will also involve encouraging countries with excess saving to reduce their saving or increase their investment. Policies that seek to stimulate demand through exchange rate changes are a zero-sum game, as demand gained in one place will be lost in another. And no the problem is not competitive depreciations, as Summers suggest. And not even a question of whether depreciation, the relative price substitution effect, would be enough to boost exports or reduce imports, which might be questionable (the last evidence I saw suggested that income elasticities tend to be larger than price elasticities, meaning that foreign trade responds more to changes in the level of activity), by the way. The problem is this notion that the solution is based on surplus countries spending more, as if the US does not have a privileged position and its external (and by the way domestic) deficits do not matter. What Summers is saying is that depreciation does not work, but we need China and Saudi Arabia to boost the world economy. Seriously?! The US should be doing expansionary fiscal policy, and with that current account deficit would be even larger. The notion that there is a current account sustainability issue or that the dollar international reserve position might in danger is not particularly strong. But, at least on the policy issue, Summers is correct. Fiscal expansion is needed. Note, however, that there is no secular stagnation problem, associated to lack of investment opportunities. There is a political problem (remember Kalecki) that precludes more fiscal expansion. * Krugman arguments were normally about the domestic economy, and the problem of the zero bound interest rate, or what he calls the liquidity trap. ** And there are too many problems with the excess savings story to discuss here. The investment schedule and the very existence of a natural rate of interest, negative or otherwise, is plagued by logical problems and by the complete lack of empirical evidence, since investment really reacts to changes in the level of activity (accelerator). Also, the notion that intertemporal decisions govern consumption behavior is not without its problems. That’s why Keynes tried to abandon the loanable funds theory and developed effective demand, in which income adjusted for differences between investment and savings.